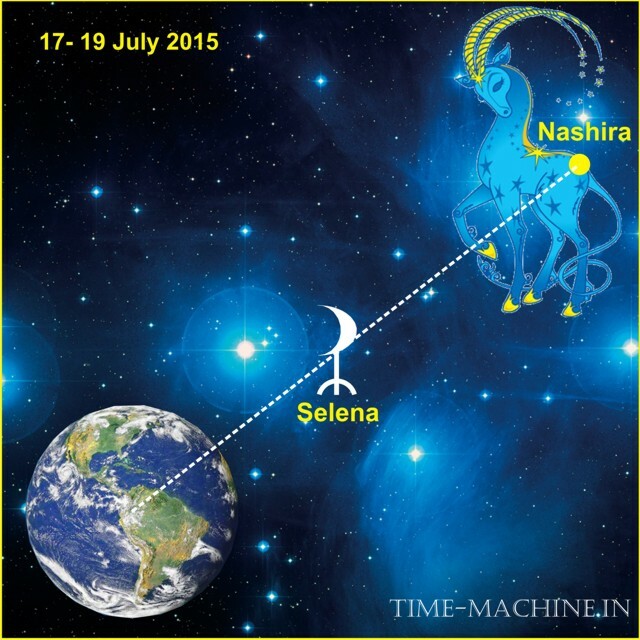 From 17 to 19 July 2015 White Moon - Selena in conjunction with the star Nashiri . (40 gamma Capricorn m 3.68). Royal, a good star Nashiri, in Arabic - "lucky, bringing good news." Nashiri, gives a person a life full of changes (the sphere of influence of a particular manifestation Nashiri depends on its position in the natal chart). This star is found in the horoscopes of prominent physicists, nuclear scientists, innovators in the arts and sciences. Nashiri weakens heavy coarse vibration of the planet of Capricorn - Saturn, paves the way to success, gives the desired life changes and attracts people patron. It gives the pursuit of fairness and justice, especially in these days, in conjunction with the White Moon - Selena. Trying to achieve success in a negative fact, using a star Nashiri in conjunction with Selena, give a complete fiasco, until misfortune, especially for owners of adverse horoscope. Selenium compounds - Nashiri is particularly true for people, communities and events related to the dates around 10 of February and have sensitive points in the 22-23 degrees of Aquarius.